First of all a big thank you to all of the missionaries that submitted an application for one of the $500 online donations. We had a very good turnout of applicants and our private donors were thrilled to hear about what you all are doing! It was a hard decision to pick through each applicant but our donors felt very connected to two missionary fundraisers. So we are excited to announce the the two applicants! Each will receive a one time gift of $500 for their mission! "The Lulu Tree is a 501 (c)(3) dedicated to preventing tomorrow's orphans by equipping today's families. We're currently working in the slums and villages of Uganda and Sierra Leone, partnering with single mothers to equip them to care for their children. We believe in putting the lonely in families (Psalm 68:6). None of us on the western side is paid, but rather, strives to serve purely out of love. We want to see The Lulu Tree become self-sustainable in each country it works in; we want to see Ugandans caring for Ugandans and Sierra Leoneans caring for Sierra Leoneans. The $500 would go towards our Elijah House, a baby home which we are building to house babies who've been thrown in the garbage. These babies will be cared for by widowed grandmothers on 10 acres of farmland outside of Kampala, Uganda, where our Lulu mamas and daughters will garden and raise goats to care for the Lulu family. Lulu's pastors disciple the mothers and our Lulu mama, Esther Tendo, is a single mother who serves as our country director. We are grateful that you would consider us. God bless you." "There's no denying it: by doing what you love you inspire and awaken the hearts of others. Inspiring Australia's youth is at the core of Team Help! 's goal. How can we achieve that? As father and sons, we're going to break a current world record and swim Australia's longest river, the River Murray - a total distance of 2508 Kilometers. Team Help! has created the Take Your Dream Essay Contest to actively engage the youth of Australia during our swim - encouraging them to share their dreams with the world. The winners of our contest will be included in our feature film, "Take Your Dreams." This is a large undertaking because we've chosen to engage thousands of youth across Australia in a relationship. Our team is currently traveling the border of New South Wales and Victoria, a total distance of over 2500 km to encourage youth in schools. We've already had dozens of assemblies where our team has inspired young people. In a few short months, our team will begin the swim down the Murray River. Again stopping in each city to visit with youth and again share our passion. But this time, we'll have the opportunity to share the real passion of our hearts, Jesus Christ. We anticipate prayer, and revival on the river banks all along the Murray River. Team Help! is build on the idea of reaching out to someone in the world who feels forgotten and assuring them that they're not. It's the ultimate goal Team Help! places on their vision. Just this week we met with two people who told us they had come to a saving knowledge of Christ when our team was in their city last year. Can you imagine how excited we were to hear of the fruits of our labor!? Glorious rejoicing! No director, staff or persons on Team Help! or its affiliate, Help! World Tour are paid for their services. Our team has a high commitment of giving back to their communities and the world. Each person on the team is responsible for raising the necessary financial support to join our team. Combined personal finances cover food and lodging costs for our team while on the road. The $500 grant will be used to specifically for a microphone and camera accessories for our team who will be filming students along our journey - gathering their dream story to share with the world. This is the opportunity we believe we can use to go deeper with each student as we share our own passion in Christ. Thank you for considering Team Help! and their ongoing pursuit of Kingdom salvation with Christ." Again a big thank you to our private donors for sponsoring these donations! If you are looking for a missionary fundraising website look no further then Continue to Give! We can offer you online giving, mobile giving, a fundraising kiosk, and much much more! The lifestyle of a faith-based missionary is filled with adventure. Having watched my parents and other believers live life on nothing but God's grace and the generosity of the church instilled in me a love for this kind of missions. It's almost romantic - dedicating your life to something that can't be seen. It's also amazing being able to watch God provide time and time again. Yet as I reflect on the steps my parents took to join the ministry and the steps I'm currently taking into the mission field, I cannot help but notice that I have clear advantages and even clearer disadvantages, and most of this is based solely on one glaring fact. I was born in 1994 (meaning I turn 22 this year, if you are curious), which places me in Generation Y, also known as the Millennial generation. There's nothing special about this generation from a money standpoint, except that it is filled with young adults who are just finishing their education and establishing themselves in careers. What I've found with this group of young people are two things - entry-level pay and mounds of college debt. These people, if they end up joining a financial support team, typically cannot commit to high levels of support, and that's if they commit at all. This group of people also happens to be my peer group. These are the people with whom I emotionally and spiritually struggled through college. Most of my closest friends are millennials, and though I know most of them would financially support me if they had the means, many of them are struggling just to make ends meet. So then what happens when your list of potential supporters are poor college students? No one is going to be able to assist you financially unless they know you have a need. One must be willing to use the many ways that are now available to get the word out. I think it's important to note that you aren't "begging for money" when you do this, but rather giving the Body of Christ an opportunity to join your mission. Besides, many people are willing to give. A big part of the struggle of fundraising is the "how-to" in getting information to the public. Look to use different techniques. Create clear literature that is well-suited for your audience. A study done by InformationWeek indicated that a majority of baby boomers prefer news and financial information on paper that is easy to understand. Give them something they can read during church presentations or give them a phone call in order to establish a personal connection. Also, don't discount using social media outlets like Facebook to get the word out. FoxBusiness studied the numbers; Baby Boomers represent the biggest number of new users on Facebook. Use a crowdfunding app to spread the word like wildfire! With the advent of online giving apps and crowdfunding, supporting missionaries is now easier than ever. Make this option available to your potential supporters. Not only does it make giving simple, but many of these applications allow you to to track charitable donations, making it easier for you. It may surprise you that many people whom you might expect to prefer giving money the "old-fashioned way" actually use online giving tools to support you or your ministry. The vice-versa is also true. Some of the most tech-savvy people may still prefer to do their giving with a check in the mail. Either way, you want to meet the preferences of your supporters for missionary fundraising. During a missionary training class I attended, one of the instructors asked if I would go to the front and make a staged phone call to a potential supporter. I did everything I was trained to do, yet the person I was speaking with threw me a curveball. She told me that her son was sick and couldn't commit to full-time support. I offered to put her on our church's prayer wall and then ended the phone call. When I was critiqued, my instructors encouraged me that I could have done so much more during that one phone call. What I needed to do was change my mindset. I'm not just fundraising; I'm ministering, too. Take the time with to pray with and minister to your potential supporters. Seek to meet them on their level. Between newsletters and video updates, the tools to update your supporters are endless. In order to save money and time, it may be best to think about which media outlet to use in order to best reach an audience. Newsletters are typically more effective to the older generation. Younger generations focus on outlets that take the least amount of their time. Thus, you may only want to send out newsletters with text to donate numbers with a mobile giving app to the people who are going to read them. Don't be afraid to ask supporters about their preferences. Obtaining the commitment of a supporter does not mean that the job is done. Make it a daily practice to keep up the connection with your supporters. That may be through the thank-yous that you write when you send out receipts. That may mean making a connection whenever you're visiting their town. 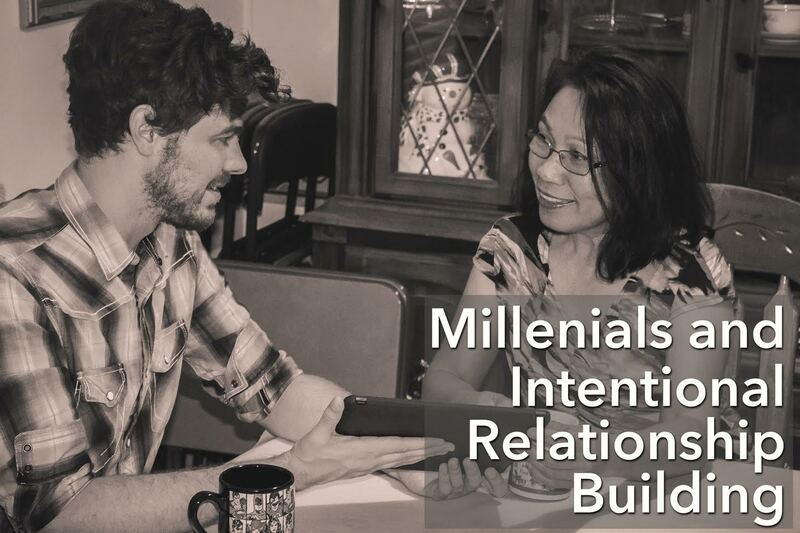 Whatever it may be, making these relationships simply takes intentional effort. When you follow these principles, you'll find yourself making more than just a network of individuals who can commit to supporting you financially; you will make some of the most encouraging friends you never knew you could have with someone thirty years older than you. Make the leap and start networking. I guarantee that you won't regret it. You have a passion for missions. You have a passion to change the world. You have a passion for people and giving. But how do you pay for your mission trip? How do you accomplish that? Raising money as a missionary is not easy. Less than 20% of missionaries are able to raise the complete needed funds for their trip. That means less than 2 in 10 can actually accomplish the mission they want because of lack of funding. This can be hard and even harder when you are on your trip and you have to say no. But there is hope! Missionary fundraising is possible especially with the help of this missionary grant! Continue to Give has teamed up with a private donor to offer two missionaries the chance to acquire a $500 one time donation to your missionary fundraising page! This is a great opportunity to tell a new donor about your online fundraising for missions, what you will use their donation for, and now finally be $500 closer to your fundraising goal. What are some of the requirements? This opportunity is only for missionaries or mission trips, short or long term, that are actively fundraising on Continue to Give. This is also open to a group mission trip fundraising project that a church may be putting together. Our private donor will then look through all the applications and choose two applications that speak to their heart. Right now we will be taking applications until the end of August. This also means if you are not fundraising on Continue to Giveâs website right now and you want to be eligible simply go on today and make yourself and account and then apply! There is no requirement on how long you must have your missionary support page up and running to be eligible. To apply you must complete 2 things: the application of the link below AND comment on this blog that you have applied. Click here to fill out the short application to be eligible for one of the $500 donations. Donât forget to comment below that you have applied! The world may be getting smaller, but it can seem impossibly vast to church missionaries and those who face the challenge of keeping them connected to home. These committed individuals travel to missions around the world and to remote locations in their home countries. All the love, dedication, and spiritual giving that goes into their work is not sustainable without support from the church's mission fundraising efforts. At the same time, the cultural and logistical challenges built into missionary work can make church donation difficult. Fortunately, church online giving offers a new level of convenience, security and interconnectedness that was never before possible. New opportunities for giving now make it easy to enlist supporters, allowing them to contribute their church offering in a customized way suited to each giver's lifestyle, and to the needs of each church. The church website is an anchor for adopting the newest, most streamlined approaches to giving. This online presence serves as a platform for disseminating information about all church functions, but that is not all. Interactive methods, such as a faith-based giving platform, invite response and participation, requiring minimal effort on the part of supporters. Crowdfunding is not a new idea. In fact, churches have long survived based on small donations from the broad base of their supporters or members. What is new? Online crowdfunding. Naturally, the crowd is bigger and more diverse, allowing awareness of the need or cause such as missionary support to grow exponentially. Online crowdfunding adds a mobile dimension to giving, extending the base of support beyond a limited local audience to a global one, making for a perfect fit with missionaries who, by their nature, are mobile, traveling far and wide. Whatever the primary focus or location of their mission, they need to maintain continuous support in order to achieve their goals. Online crowdfunding is also highly mobile, especially with advanced platforms such as the one provided by Continue To Give. Once the church or organization is a participant in the platform and has set up its page, the individual missionary can then create their own personal page and apply to be a missionary of their church. The church can accept the request just as we do with a Facebook friend request. The missionary then creates a giving page and can begin using a variety of tools to start and continue fundraising, all with no technical knowledge required. Use online giving to build missionary support with one or more of these inventive tools. 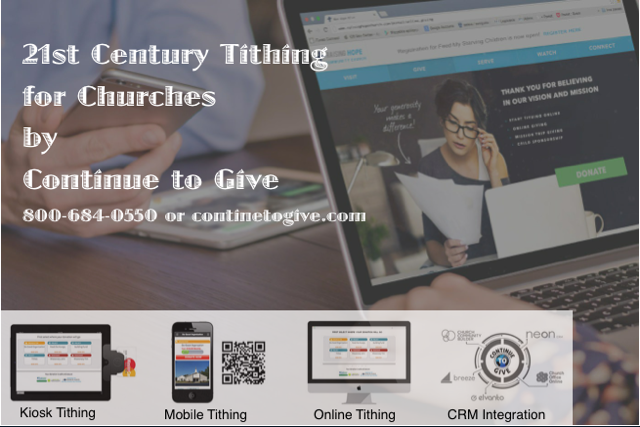 Online Tithing and Fundraising: Use the "create your badge" function, choosing among the types of giving formats available. Then, simply paste the badge onto your fundraising page. Once you activate the badge, visitors to your page can begin giving immediately. Crowdfunding: From your fundraising page, connect with the giving platform's social media sharing tools. Use them to share information about your fundraiser concept with family and friends. Add stories and references to your regular blog posts, and point followers to your mission fundraising page with a blog integration function. Social media will enable your information to go viral. Mobile Tithing and Fundraising: Another way to make the most of your fundraising page by activating its already available "go mobile" functions. You can add a text-to-give donate number, or a QR code, or both. Supporters can scan the QR code or text the number to make donations directly from their mobile phones, while they are thinking of it. Make supporters aware of this easy option by noting it on direct mail pieces and letters, in the church bulletin, and at every special fundraiser event. Kiosk Tithing and Fundraising: Order your church kiosk stand for placement in a convenient location at your church or mission. Once you download the free app for "offering kiosk" onto your iPad or Android, you are ready to secure your tablet to the kiosk, where supporters can easily use it to donate on the spot, even swiping their debit cards for fast, easy processing. Mobile kiosks adapt to any temporary location, such as a one-day fundraiser event. They can also be used in a church lobby. Facebook Fundraising: The first step is to create an interesting, dynamic Facebook page for your mission. Include photos of your location and events, and, most importantly, of the people you are serving. Make the mission real for those who visit your page by describing the activities you have completed, and those you are planning for the future, along with any successful outcomes. If your mission is new or planned for the future, outline the goals and what you hope to accomplish. Then, go to your platform fundraising page and use the same "create your badge" function outlined above. It provides very simple instructions for adding your giving form to your Facebook page. Asking friends to donate publicly means you can post to their wall, spreading the word even further. Creating this kind of presence on your Facebook page is a great foundation for further promotion of your cause. If you create interest in your fundraiser event and your cause, you can achieve wider publicity through local TV or radio media. When it comes to charitable giving, online donations through a platform like Continue To Give offer greater security and accountability than ever before. Amounts donated to missionaries will go directly into the bank account of the church or nonprofit organization, using IRS data for 501 (c)(3) organizations. Donations are received in real time, through a secure, third-party processor, and can be made by credit card or electronic check. All online donation platforms charge a fee that depends on the estimated donation amounts and, often, the number of transactions in each type of service. These amounts go in part toward covering bank processing fees. Receiving organizations should check to see what fees they will be charged for using the site's services. If you are unsure of the fees, check with the provider first to make sure you know what to expect. Each participating church or organization will show certifications in the form of badges on their fundraising pages. These assure givers that they are choosing a reliable, certified recipient, and that they have correctly identified the intended group. The church and giver receives a receipt for each donation, and can easily access a reporting tool to track amounts raised for each mission or missionary. In addition Continue to Give offers integration with your organization's accounting software for easy bookkeeping. This will take the stress off your staff for keeping records straight. If you would like to learn more or start a free demo of all the different giving avenues click here! We are Shane and Ana Cooper, missionaries who have been involved in short term missions to Honduras over the past 6 years. We are Christians and members of the Beavertown Church in Beavertown, Pennsylvania. We are currently working to launch a full time ministry in Honduras called MissionWings. At this time we are working to get the funding behind us that will help make this ministry a reality. We are currently raising the monthly support needed for operations as well as the funding to acquire a modified Cessna 206 aircraft for mission work in Honduras. Our goal is to use a small airplane to provide emergency medical flights, disaster relief operations and humanitarian aid to remote villages in Honduras. We also intend to provide air transportation services to missionaries and mission work teams, giving them easier access into remote areas and a faster means of transportation. Ultimately, our goal is to facilitate the spreading God's love and His message. Or texting the number 4809528 to 715-803-4772. We also encourage you to learn more about us by visiting our personal website at www.missionaryaviator.com. There you can also make donations through our website by clicking the donate button and filling out the Continue to Give donation form. There are benefits for those who partner with us by setting up a recurring donation of $12.50 per month or more as you will become a member of one of our five insider clubs. So please consider setting up a recurring donation today! Thank you for making a difference in giving hope to the people of Honduras through your support to this ministry endeavor. If you need missionary fundraising you can sign up today at ContinuetoGive.com! Hi my name is Carla Rice and I am heading out on my very first mission trip with 15 other members of my church Mount Olive with Groundwork Guatemala. Going on a mission trip has been on my "bucket list" for quite a while and being presented this opportunity I jumped at the chance. When I listened to my pastor talk about the experience he recently had during his trip I was intrigued and excited and even more so when I saw the pictures of the kids and families worshipping together. I can not imagine how much I will be able to learn from the Guatemalans and how much I will be able to grow spiritually. I look forward to being able to touch the lives of other people and share my faith with them, but I want to also embrace them to share their faith with me. 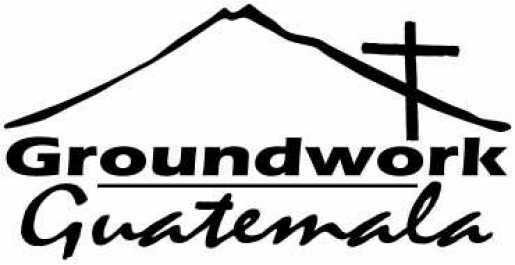 Groundwork Guatemala is a ministry that is all about connecting people. Our call, as Christians, is to connect the lost to the Living Word, Jesus Christ; then equip them for a life of service to our Savior and Lord. I feel that God has called me to join together with this ministry and our mission team as we partner together to share our faith and gifts with the people of Guatemala by assisting them spiritually, emotionally, and physically. Our mission team, along with an awesome team of Guatemalan missionaries will share the Lord with adults, teens, and children in Guatemala City and the surrounding villages, as faith lessons are taught and a strong spiritual foundation is laid. Through caring relationships, people come face to face with Christ and His love as we visit and pray together in their homes. We will also be taking various kinds of donations from hygiene kits to school supplies with us to distribute. As with any mission trip, there is a need for financial assistance. During the next few months I will be working to raise funds to pay for my airfare and other expenses, as well as to help purchase supplies for the health kits, vitamins, and school supplies to name a few items. I am raising money online for this trip. If, after prayerful consideration, you feel led to assist me in my endeavor to help me serve, donations online are welcome and can be made at Support My Mission Trip Here. If you need to start a mission fundraising project like Carla you can do so today at Continue to Give! A message from William Looft: A current missionary raising support with Continue to Give's online, mobile, kiosk, and Facebook egiving solutions. Greetings everyone! My name is William Looft and I am from Oneida, a small Central Upstate City in New York State, and God has given me a heart and a passion for short term mission work and the disabled. I am asking you for your prayers and support. I have explored many needs that exist across Christ's Kingdom and now I am prepared to go heartily, like Isaiah who said: "Here am I, Send me!" I have a daughter that at the age of 15 tried committing suicide. Any parent would not understand and know how to cope with the situation so I reached out to seek a God that I knew about but never made the connection with. I started attending church one Sunday and the message was speaking directly to me. I went three more weeks and the same thing again, the messages were speaking to me! The messages were about attitude; it changed my life! I then asked God to come into my life and I accepted him as my Lord and Savior and was baptized a few months later. Now God has put a passion inside me to go work with younger children and teens to hopefully change their lives. I want them understand things in life are not as bad as they may think and that there are other alternatives. With all my mission work, this will be my 5th International trip and I have been spiritually moved and shown so much by our Lord and Savior. Again I know that the Holy Spirit will have me go and tell my story about how I gave my life to Christ on February 22, 2008 at the age of 54 and hopefully my story will be that mustard seed to someone else in need of a Savior. I will be traveling to Carnlough, North Ireland with RP Missions. While there, the team will be laboring with Pastor George Johnston in Carnlough and two other communities May 21-June 28, 2015. The team will help with literature distribution, organizing soccer camps for community children, and preparing Bible lessons for those attending. The team will also provide evening Holiday Bible Clubs (VBS) for these three communities. Did you know that the Irish teen starts drinking by the age of 15 and some even earlier as low as the age 8? 2013 statistics state that teens will drink on the average of 10.7 liters of pure alcohol. Also 1/5 th of teens have used and abused the dangerous drug cannabis becoming addicted shortly after and Ireland also has the second highest suicide rate in Europe with the average ages between 15 to 19 years old and even a small number of 5 to 9 years of age. As you may know, there are always travel and other expenses with these trips. If you would be interested in supporting my mission work, you can do so in two important ways. First and most important, please PRAY for safe travels for the team and myself and God's direction in saying and doing the right things to those that I will be ministering to. Second thing I need to raise support for expenses in a very short time. Would you please consider helping me? Please remember there is no donation that is too small as God blesses all people who give generously for God's Kingdom. You can be part of helping me reach the end goal by praying and donating! If you need mission fundraising for your short-term missions or want to raise money for any other need like William, you can start today as missionaries under your church or sponsoring organization!